In 2001 Iasis commenced a project in East Timor. Gaining their country’s freedom has been costly for the people of East Timor. In the final weeks of Indonesian occupation, most of the country’s infrastructure, including hospitals and clinics, was destroyed. Many healthcare workers either fled or were killed. Only a handful of doctors remained to serve the healthcare needs of a million people. Iasis came across a group of local nurses working with the island communities of the remote island of Atauro. 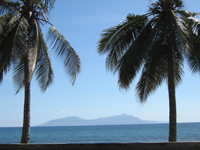 Located 20 miles across the sea from Dili (East Timor’s capital city), Atauro, had been a place of exile and imprisonment during the Indonesian occupation. The island is covered in dense woodland, with no road network. The island people would have to walk for several hours over difficult terrain to reach the main clinic. We raised money for a sea ambulance, designed along the lines of local fishing boats to enable easy access around the island. 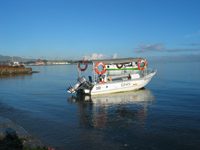 After discussions with the Minister of Health, the boat became integrated into the country’s ambulance service for medical emergency evacuations off the island. It also used by nurses as a mobile clinic where the Iasis team worked alongside the local nurses on Atauro, providing assistance in primary healthcare clinics. Due to the political instability of the country it has been difficult to monitor the progress of the boat, but we hope that by providing the boat a precedent was set to prioritise the medical and transport needs of people living in the remotest regions of East Timor.